So in case you haven’t gathered from Part 1, I don’t as a rule use IE – only on my 8” win8.1 tablet. I moved way from IE to Firefox years and years ago and that was simply because of the support for extension to let me do clever things – such as tab manipulation, mouse gestures for browsing, support for auto-highlighting search terms on my pages. 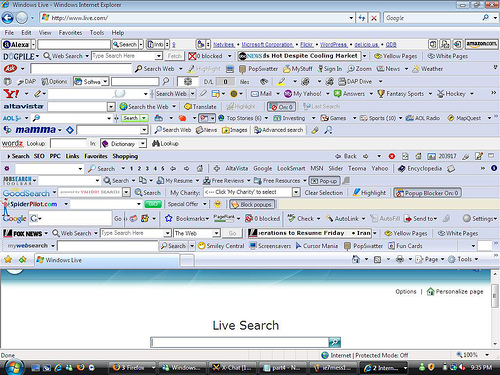 Firefox let me do these things – to me it was a power user browser. Since I started using Firefox Chrome came on the scene but I never really embraced it, the main customisation I use in Firefox was about how it handled search & Chrome being a Google product did search the Google approved way. Having been a Windows Phone user from launch I was happy enough with Mobile IE and have been pleased with the improvements bought to the experience coming in with WP8. Using it on mobile and my Win8.1 tablet is actually not bad but it wasn’t enough to persuade me to go back to IE on the desktop and the lack of any extension support for these platforms is still a thorn in my side. Particularly lack of support for things like LastPass – logging into all those sites manually is a total PITA. In the meantime my personal IT habits shifted to embrace the emergence of “cloudization” and I started benefiting from having my files and setting sync between PC’s without me having to remember to do anything I was coming a cropper. I was living in two different digital worlds from a browsing point of view. On my desktops I would be using Firefox with its “Sync” platform to keep my Surface and Desktop extensions the same. I had IE Mobile and IE Metro in use on my phone and companion device which could share open tabs and browsing history and then just to top it all off I had LastPass with its own application level data sync for my website passwords. So where does this leave us with the rumours of a new Microsoft made browser? Well the Microsoft of now is singing to a different tune than the one that first created IE. The Microsoft of now is fully behind “experiences”, understands the mobile world and is getting the hang of rapid/agile development process. Then count me in and sign me up! Now doesn’t that sound like a browser you would want to use? The tricky bit is how MS bring this to market – an area where they have typically struggled. MS are not good at explaining their strategies or stories to end-users leading to confusion and ultimately frustration. There is also another huge fly in the ointment with Microsoft’s traditional customers – business. With my IT Pro hat on I can see that MS has some big issues to overcome in the enterprise with this new approach but if the rumours are true then they seem to be taking a sensible. The rumours to-date suggest that IE will contain two “dll” based engines. One the legacy engine that IE uses right now, and the other the newer Spartan engine. When compatibility mode is called the Trident engine is given the task, otherwise Spartan takes over. This still leaves the UI issues up in the air – large companies get very twitchy when UI is changed as it suddenly requires re-training of users and means heaps of training documentation is now invalid. Will this cause a headache for IT departments in the short/medium term – probably but it’s likely going to be no worse than the migration planning that went into scouring the enterprise of all Windows XP remnants (oh wait). Will MS figure it out in Spartan V2? – More likely! Will I use Spartan?– stands a chance! Am I excited by internet browsers? – Unfortunately but hey that’s what being an IT Pro is about right?! This news about Spartan, is to me me, ultimately another extension of the new MS “Write once run everywhere” philosophy and as an end-user that’s something I’m very keen to embrace.